Mike at DP Auto found a terrific low-mileage Wrangler 2-door for my wife, and I saw how family-oriented and fair Mike and the entire crew were all through the process. We were very happy with the vehicle. And wouldn't you know it - a few months later I decided to get a new Jeep. I went straight to Mike and discussed how I wanted to cherry-pick a newer Jeep. And Voila! Mike did it again, finding me a low-mileage model with everything else I wanted at a reasonable price! All I can say is that we will be lifelong customers to DP Auto, not only for new vehicles but for the outstanding service their shop and staff provide. If you want top value, while still retaining good old-fashioned service, go see Mike and the crew at De Pere Auto! 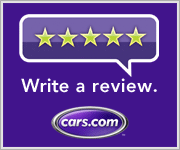 cars.com: Great Experience Every Time - Repairs and Sales! I never have to worry when working with De Pere Auto. We started out using them for all of the work done on our cars when they were recommended by a co-worker. Wisconsin winters were unforgiving on our older cars. They are always helpful when it comes to loaner cars and setting up appointments so you don't have to interrupt the rest of your life. Due to an unfortunate purchase of a "lemon" from another used car lot in the area we were in need of a new car on short notice, De Pere Auto helped us get into a newer, clean, and safe vehicle for our family. We just purchased our 2nd vehicle from them to replace the other aging car we had. If we need another car any time in the future, you can bet we will go to De Pere Auto first. From Facebook: What AMAZING customer service and friendly staff. Love the monthly newsletter too. We purchased a car at very reasonable price. Our used car dealer for life. Check them out-Highly recommended. Great place to buy a car. Great value on trade and was the lowest price on the purchase vehicle within 100 miles while taking model, year, mileage, etc. into account. Would shop there first when purchasing next vehicle. My husband and I just bought our fifth car from De Pere Auto. They sell excellent quality used cars. They have a service dept. and they inspect them before they put them on the lot. The prices are fair and the service is excellent. If you know what you want for a vehicle they will try and locate one for you also. They are non commission and they aren't pushy. The sticker price is pretty much what you pay and I prefer that than having to "make a deal". When our cars need work, we always have them do it. We know we can trust them to be honest. We have also used their auto body service. If you like antiques and old cars they have lots of eye candy for you too! Larry is the owner and two of his sons help run the place and it is always nice to support small businesses. From yelp.com: Great place! Very meticulous, knowledgeable and honest. They did some body work on my truck that I have been putting off. Turned out better than I expected. Now I feel like I have a new truck. Very friendly service. Worked around my schedule so I didn't have to leave work. Allowed to keep loaner car overnight. I highly recommend them. I would like to thank you at this time for how kind and thoughtful you have been to me. I needed to get a vehicle that could transport a boat to KY. I found one. The truck needed work and you gave me all the details of the work. I went back to the dealer and got some items taken care of for free. What they thought didn't need changing at this time I had done by you. I am so thankful to have friends like to take care of me and my vehicles! You do not know how comforting this is. We made it to KY without any problems.the safety of the truck made it easy to travel the highways through Chicago and many more. I'd do it again. Thanks again for you help and friendship!